I purchased this bowl at a yard sale and I don't know any history about it. I have searched many forums and posted inquiry's on them as well as join groups to see if anyone could tell me about it. The frustration is me not finding out any information after doing exhaustive daily searches for information. 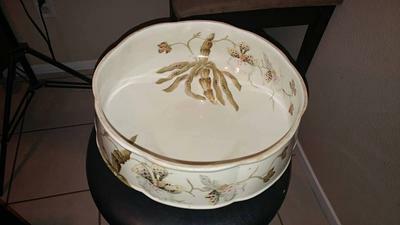 After I find out more about this bowl I will share it with others that are interested about this bowl. 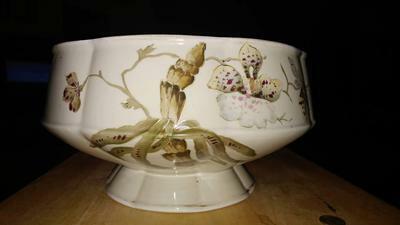 What I do know about this bowl is: It is a hard paste porcelain bowl, the orchids that are hand painted on the bowl are called Catasetum Genus. There is guilding on the bowl, but not sure if it's real gold or not. The numbers on the bowl 4655 might be the pattern number. The initials are stamped into the bowl on the under glaze since it is glazed over. The initials are "ELF. There is a chance that the initials are "ELP." The bowl is 10 inches in diameter. 5 1/2 inches tall. Weighs 4.16 pounds. 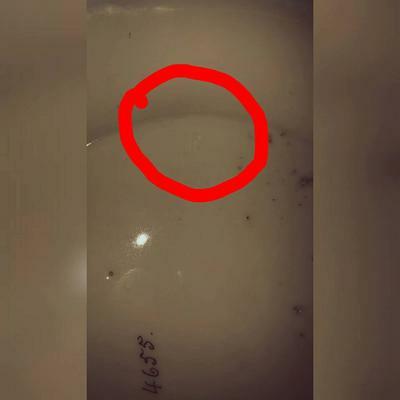 I recently found another marking in the under glaze and it looks like the number 10 sitting sideways with the 0 sitting on top of the 1. Since there is no way for me to edit or add a picture to my original post...I am adding the new info as a comment.